For many novice ESL/EFL teachers the transition from their teacher education program (Cert or MA) to their first year of teaching has been characterized as a type of 'reality shock' because the ideals that novice teachers may have formed during the education program are often replaced by the harsh realities of the classroom, and social and political contexts of the school in which they are teaching. One reason for this may be that teacher education programs are unable to reproduce an environment similar to that teachers face when they graduate. Even though many schools may have induction programs available, novice teachers are often left to cope on their own in a sink-or-swim type situation, with some ultimately leaving the profession because of difficulties encountered during their first year. EVERY teacher must experience life as a novice when they begin their teaching career in a real classroom, and From Trainee to Teacher is the book that will make the transition from the training course to the classroom as smooth as possible because it focuses on the needs of the novice teachers in particular. From Trainee to Teacher outlines and describes a comprehensive framework for the professional development of novice teachers through reflective practice that is grounded in the classroom realities of real teaching contexts so that they can develop beyond their novice years and become expert ESL/EFL teachers. In addition, the suggestions presented in this book can be operationalized as standards for future ESL/EFL teacher education and development programs worldwide. The book certainly stirs up a number of issues and is quite an eye-opener. Without doubt, it amounts to a first-year practitioner's toolkit, providing the first step in marking the route with, perhaps, the identification of more concrete teaching content to be followed. All in all, the book is an excellent case study of a teachers' support group whose aim is being fulfilled as they reflect on their professional problems. A valuable contribution to the scholarship on language teacher education. 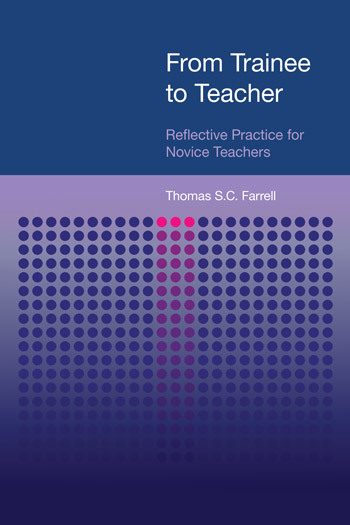 Thomas Farrell makes a persuasive argument about the need for greater support for pre-service and novice teachers, and this volume provides an important part of that support through compelling stories from novice teachers, insightful analysis, and pragmatic advice on the utility of reflective practice. This book is a must read for novice ESL teachers, as well as those who teach in and design teacher preparation programs.